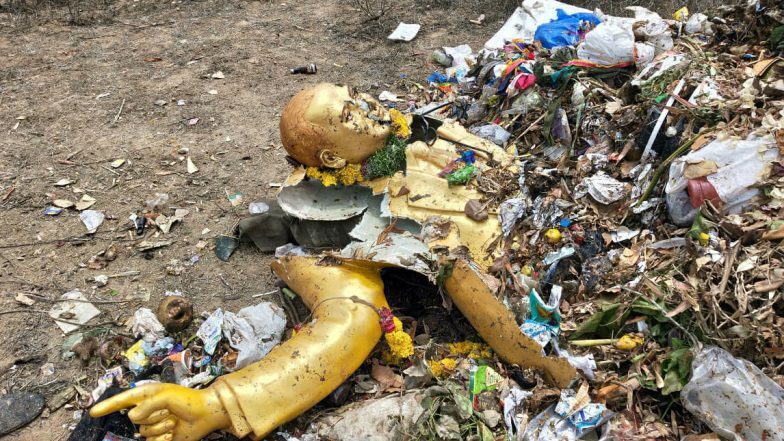 Hyderabad, April 14: An Ambedkar statue, removed by the civic staff after being installed here without permission, was allegedly carried in a garbage truck and found damaged following which two people, including its driver, were arrested Sunday, police said. As the incident which occurred a day ahead of the birth anniversary of the Dalit icon triggered protests by some Dalit organisations, the Greater Hyderabad Municipal Corporation (GHMC) ordered an internal inquiry into it and suspended an outsourced vehicle operator. Ambedkar Jayanti 2019 Quotes on Dr Bhim Rao Ambedkar's 128th Birth Anniversary: Famous Sayings by the Father of Indian Constitution to Remember on This Day. According to GHMC, a group of people attempted to install the life-size statue near Panjagutta circle here "without permission" in the wee hours Saturday. The civic staff prevented it and shifted the statue to a nearby stadium. They claimed the statue was removed in the truck hours later by the outsourced operator without authorisation and it suffered damage when some people intercepted the vehicle and tried to take it out forcibly. However, members of the Dalit organisations, who held protests demanding action against those responsible for the incident, maintained they found the statue damaged in the garbage truck. Acting on a complaint by a Dalit outfit leader, Police arrested the GHMC driver of the truck and another person on charges of damaging the statue and shifting it in the garbage truck to the dumping yard. The complainant alleged he found broken pieces of the Ambedkar statue when garbage was unloaded at the dumping yard. The driver had told him he carried out the instructions of GHMC officials, the Dalit leader said seeking action against those responsbile, a police release said. Based on the complaint, a case under the SC/ST (Preventionof Atrocities) Actand the IPC had been registered, it said adding the investigation was in progress to establish the identity other culprits. Ambedkar Jayanti 2019: President of India Ram Nath Kovind Greets Nation on Eve of Dr Babasaheb Ambedkar Birth Anniversary. GHMC Commissioner M Dana Kishore in a release said an internal enquiry was on into the matter. An outsourced operator "responsible" for shifting the statue from the stadium had been suspended as there was no permission from higher officials for removing it, he said. GHMC officials said they have also brought the matter to the notice of police. IPL 2019 Today's Cricket Match Schedule, Start Time, Points Table, Live Streaming, Live Score of April 18 T20 Game and Highlights of Previous Match!